This directory lists selected ramen shops in the Tokyo area. See also our article on styles of ramen, with a few picks for each style. Note that many ramen shops will close before their posted hours if they run out of soup. Please see our cuisine and menu-reading guide to ramen to learn more. The draws here are the great tsukemen noodles, herb-grilled pork, and a sweet fish-pork blend soup that incorporates blueberries and other fruit. Open 11:30am-2:30, 6pm-1am (Sun -8pm) daily. The unusual chicken ramen here is topped with lettuce, tomato and olive oil. Tsukemen is the specialty here; it comes in three different sizes, but they're all the same price - Y720. Open 11:30am-3, 5:30-9pm (Sat, Sun 11:30-9). Closed Mondays. Open noon-2, 5-9pm. Closed weekends. Nicely textured noodles in a tasty fish-based broth are topped off with excellent home-made menma (pickled bamboo shoots). They also offer a rather novel ramen pizza. The tanmen noodles here are very spicy, but the soup has a depth of flavor the goes beyond one-note hotness. You can pick from several variations, with different levels of spiciness. Open 6-11:30pm. Closed 3rd Sunday. Open 11am-3, 5-9pm. Closed Sundays. Open 10:45am-midnight. Open every day. Famous Kyushu ramen; kakuni (Chinese-style stewed pork) is one of their specialties, and helps explain the long lines at lunchtime. Classic Hakata-style tonkotsu (pork-bone soup) ramen. This popular shop is known for their light, "cafe-style" shoyu ramen livened up with a bit of yuzu, and their excellent chashu. The late-night hours are convenient if you've been out on the town. A creamy, richly flavored cheese-tonkotsu ramen is the specialty at this popular shop. Excellent miso-style ramen. Gogyo blackens their miso in a kitchen-side fire show while preparing the soup. A convenient and popular Roppongi Hills branch of one of Tokyo's best shops for tsukemen-style ramen noodles. Open 11am-10:30pm (LO). Closed Sundays. This popular, rather old fashioned-looking shop is famous for their classic shoyu-style ramen. Open 7:30am-10, 11-10pm (LO) daily. Open 11am-3, 5-10pm. Closed Sundays. Open 11am-3:30, 6-10pm (LO; Sat, Sun 11-5). Closed first Sunday. Open 11am-4, 5-10pm. Closed Sundays. One of the creamiest tonkotsu ramens in Tokyo. The intensely flavorful miso ramen, made by blending three types of miso, is the recommended bowl at this hole-in-the-wall shop. Open 11am-3pm (Sat -2pm), 5:30-8pm. Closed Sundays. Open 11am-11pm (Sat, Sun -9pm) daily. Serving one of Tokyo's best bowls of miso ramen, Tsujida is popular with serious noodle connoisseurs and other ramen fans. Open 11am-4, 5:30-9pm. Closed Sundays. Open 11:30am-3, 5:30-10pm. Closed Sundays. One of the best shops in town for tsukemen-style ramen, where the noodles are served separate and dipped into a thicker soup. This very popular shop is known for their tsukemen, served with a thick, richly flavored dipping sauce made with pork, seafood and vegetables. Prepare to wait on line during busy times. Nagano-style ramen is the specialty here, served in a triple-barreled soup flavored with pork, chicken and various fish. Open 11am-2am (Sun -midnight). Closed Wednesdays. Good, solid tonkotsu ramen is served here, and they do a "vegetable ramen" with lots of fresh vegetables to go with your pork. Open 11am-4pm. Closed Tuesdays, Wednesdays. Keisuke is best known for their excellent, potently strong shoyu-style ramen. 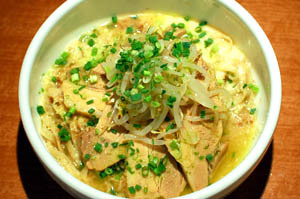 Voted best new bowl of 2009, Hajime's shio-ramen uses salt that's imported from Mongolia. Open 11:30am-3, 6pm-12:30am (LO). Closed Mondays. 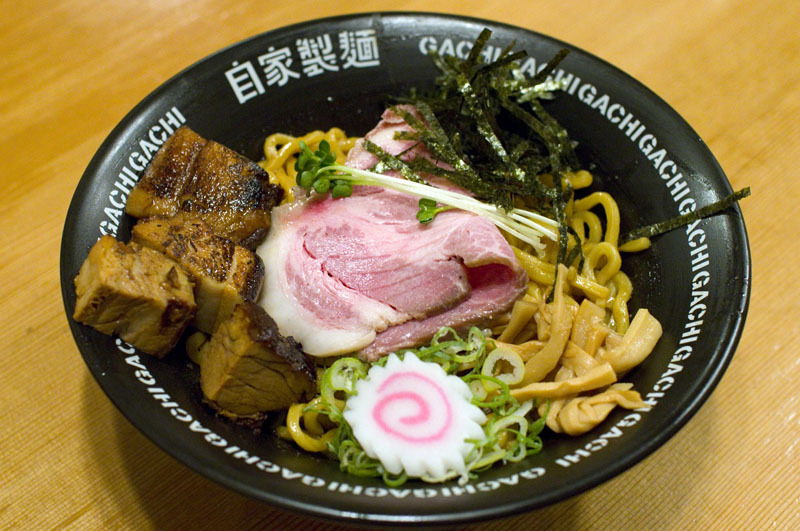 The ramen at this popular shop comes with big slabs of chashu that taste almost like ham. Open 11am-1:30am (LO; Sun -11pm) daily. Open 11:30am-3, 6pm-midnight. Closed Sun eve, Mon. Spicy (but not crazy-spicy) Chinese-style tantanmen noodles in a thick, pork-filled soup are the specialty at this small shop. They also serve good gyoza dumplings as a side dish. This long-running shop (founded in Showa 24) serves classic Tokyo-style ramen in a shoyu soup that's made with dried sardines. The wonton-men is especially recommended. This branch of the famous Ogikubo honten serves classic Tokyo-style ramen in a shoyu soup that's made with dried sardines. The wonton-men is especially recommended. Excellent shoyu ramen with thick noodles is the draw at Kyoka, along with a pleasant setting with dramatic lighting. Open 11am-3, 6-11pm. Closed Mondays. Open 11:30am-3, 6-11pm. Closed weekends. This popular shop is best known for their shoyu ramen. Closed on the 2nd, 12th, and 22nd of every month. Mitsuyado's double-cheese ramen is the perfect late-night bowl of ramen after a few drinks. Unusual for a ramen shop, there's some open-air terrace seating. A Thai-influenced green-curry ramen is the specialty here, although they also do nice versions of more ordinary ramen styles. Near Shin-Daita station, one stop from Shimo-Kitazawa. Seriously spicy ramen in a fish-based soup is the specialty at this highly rated shop. Open 11:30am-3pm. Closed Sundays, Wednesdays. Open 11am-3, 6-9pm. Closed Tuesdays. Oyaji's miso ramen uses imported Dutch lard to brew a rich, creamy soup.